Regarding yesterday’s post on the SGG (iPath Sugar ETN) trade idea, I’m still monitoring the charts of sugar futures (/SB) as well as the new proxy for the potential official swing trade on sugar, CANE ( Teucrium Sugar ETN). As SGG has historically been the most liquid sugar ETN, that was my first choice as the proxy for a long trade on sugar, which looks like a potential bottoming play with as much as 25%+ upside potential in the coming months. However, it turns out that iPath is replacing SGG with a new sugar ETN, SGGB, without allowing any new purchases of SGG. As a new ETN, SGGB is very thinly traded resulting in fairly large spreads (the difference between the bid & ask price). CANE, while still fairly thinly traded (i.e.- low volume), can experience increased spreads at times but tends to trade with a typical 1 cent spread between the bid & ask price. 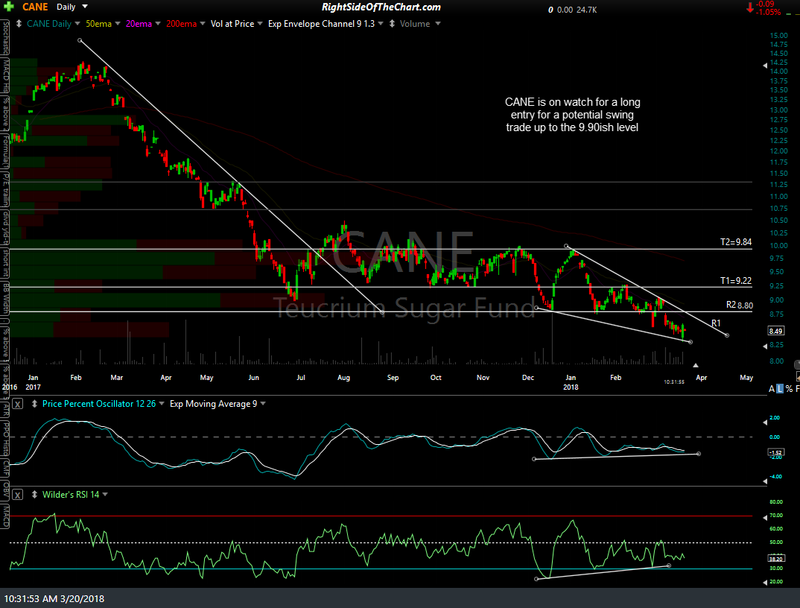 As such, CANE will be the proxy for the next trade in sugar although I am still holding off for now as I’d prefer to see some upside follow through to yesterday’s bullish engulfing candlesticks in SGG, CANE & SGGB. As SGG was ineligible for purchase yesterday & I’m still waiting for some additional confirmation for a long entry, CANE will be listed as a Long Swing Trade Setup with an entry price TBD. Hi Randy, I added SGG at closing last day. It would be great if you give us a tip for when to buy, sell or hold SGG or CANE. Thanks. I just noticed this comment as I was updating this previous post to categorize it as an Active Trade. Now that CANE is an official trade, I will post updates along the way. 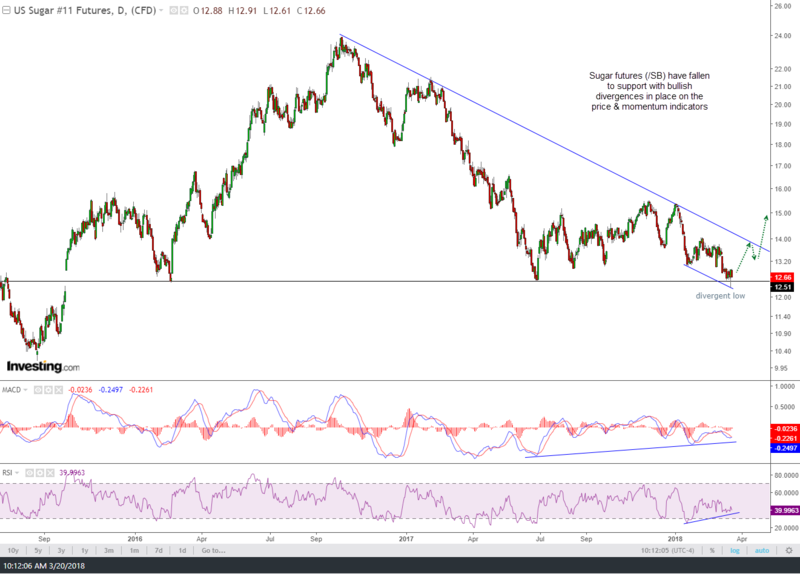 This one might require a little patience as sugar has been trading on support for a while without any decent signs of a reversal yet but I do believe that a decent case for a long trade here can be made & the upside potential of 20% & possibly much more in sugar prices in the coming months coupled with the fact that I’ve noticed quite a bit of money flowing into other agricultural commodities this year as money is finally starting to flow out of equities & needs to find a home somewhere better than near-zero interest rates on cash/money market funds. Interactive Brokers would not allow me to purchase CANE, which in hindsight, I’m glad since it will soon be delisted. As such, you might consider rolling into CANE or SGGB soon if you plan to hold the position much longer. G-luck!